Urbancom.net has been a leading provider of broadband Internet services since 1997. We have expanded our services in 2005 to include customized voice & video telephony solutions to customers operating VoIP (Voice over Internet Protocol) technology on our microwave, fiber optic and MPLS networks. By joining the delivery of voice and data traffic over a shared standard infrastructure, Urbancom.net can provide dependable top notch VoIP service, which guarantees Quality of Service that is currently not present with other stand-alone VoIP providers who use the public internet to deliver transit for voice calls. Moreover, we can help customers save 20% to 25% on their monthly phone bills. Whether your need is enterprise-wide or application-specific, we can help you develop an appropriate strategy. With an economical Cisco™ hosted PBX solution you can run your business more productively and efficiently without worrying about the costs of maintaining your own phone system. The actual system is hosted on Urbancom.net’s own secure and fully powerful network; we take care of the technical side. This leaves you free to focus on your development and success as a business. There are many numerous other features and benefits to a hosted PBX solution. There is no additional equipment to buy and enterprise grade features are available to even the smallest of operations at the same low cost. A PBX system allows multiple people to make outside calls at the same time, receive their calls from one phone number and route them however they wish, and make and transfer internal office calls. Old-fashioned phone lines cannot offer this functionality. 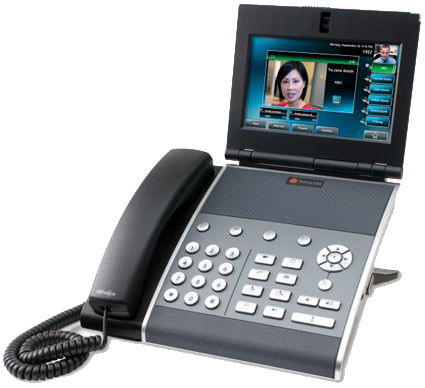 The IP phones also come with their own boosted functionality such as color touch screens, gigabit connectivity, programmable function keys, hands-free communication, and even built-in video conferencing capability. Not ready to replace your existing legacy phone system? We at Urbancom.net will provide you the benefits and cost savings of VoIP technology to your existing legacy phone system whether it has a PRI or POTS (plain old telephone service). We can install a PRI or analog adapter to provide service to your existing phone system. PRI service can be configured with 6 lines or 23 lines of service depending on the customer needs. POTS service can be distributed as 1 line, 2 lines, 4 lines, 8 lines, 10 lines, 12 lines, 16 lines or 24 lines. Urbancom.net is one of the first carriers to offer desktop video calling with the Polycom VVX1500D. This full function business media phone reduces travel expenses, enhances productivity, increases collaboration and helps builds relationships between branch offices and key customers who have compatible hardware, including any H.323 teleconferencing equipment. Polycom HDX telepresence solutions offer consumers extraordinary visual communication, enhancing collaboration from the desktop to the conference room. We provide flexible connectivity options and powerful content sharing that gives professionals the ability to communicate over distance easily and securely. Polycom HDX room and personal telepresence solutions include offerings to suit any application and any budget. This is the first business media phone that combines advanced telephony, one-touch video, and integrated business applications into a seamless, lifelike experience. The first business media phone that combines advanced telephony, one-touch video, and integrated business applications into a seamless, lifelike experience.